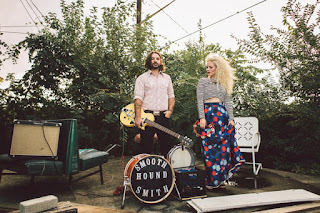 If It's Too Loud...: Smooth Hound Smith - "Stopgap Woman Blues"
Smooth Hound Smith are a hyped-up rootsy duo in the vein of The White Stripes, The Black Keys, and Shovels & Rope. What sets them apart is they're a little more traditional blues and country and less noisy or punk. Zack Smith covers vocals, guitar, foot drums, harmonica, and banjo, while Caitlin Doyle is in charge of vocals and percussion. They have a raw and primal sound in the vein of early rockabilly songs. The duo just released the video for "Stopgap Woman Blues." It features a man and woman dancing in animal masks in front of a stage while Smooth Hound Smith plays. It's the kind of rock n roll throwback that will make you pine for a time you never knew. This is modern roots music at its finest: Embracing the past while not being a novelty act. For more information on Smooth Hound Smith, check out their website. You can order their most recent album, Sweet Tennessee Honey, on iTunes, and check out the video for "Stopgap Woman Blues" below.